The Bates family before the first season of Bringing Up Bates. Gil and Kelly Jo Bates in Season 1 and Season 7 of Bringing Up Bates. When Bringing Up Bates premiered, eldest son Zach was eagerly anticipating the birth of his first child with his wife, Whitney. By Season 7, the family includes son Bradley (the first Bates grandchild) and daughter Kaci. When the series premiered, second-born Michael, who goes by “Michaella” was a sassy singleton. Now, she’s married to Brandon Keilen. In Season 1 of Bringing Up Bates, Erin and Chad Paine, were baby-free. But today, the couple are parents of three kids: Charles Steven IV (who goes by “Carson”), Brooklyn, and Everly, who was born March 30, 2018! Country music singer/songwriter William “Lawson” in Season 1 and Season 7. Bates child #5, Kenneth or “Nathan” in Season 1 and Season 7. In Season 1, Alyssa and her husband, John Webster were sweet newlyweds. Today, they’re parents to daughters Allie, Lexi, and Zoey—who was born March 28, 2018! Tori Bates in Season 1 and in Season 7 with her husband, Bobby Smith. The couple’s courtship and the planning for their Dec. 2017 wedding have been seen on Bringing Up Bates. Trace has grown up a lot between Season 1 and Season 7 of Bringing Up Bates. Carlin Bates in Season 1 and Season 7. In early 2017, Carlin began a relationship with Evan Stewart. Josie Bates in Season 1 and Season 7. In summer 2017, Josie entered a courtship with Kelton Balka. Katie Bates has grown from a cute tween in Season 1 to a beautiful young woman in Season 7. Jackson Bates sprouted from a big kid in Season 1 to a young man in Season 7. Warden Bates sported a missing tooth in Season 1 and rocks braces in Season 7. Bates kiddo #14, Isaiah, in Season 1 and Season 7. The 15th Bates, Addallee, charms the camera in Season 1 and Season 7. The sweet 16th Bates child, Ellie, grew from moppet to mature between Seasons 1 and 7. The 17th Bates child and youngest daughter, Callie-Anna, in Season 1 and Season 7. Bates child #18, Judson, in Season 1 and Season 7. The 19th and youngest Bates child, Jeb, is an adorable rascal in these photos from Season 1 and Season 7. It's time for one of TV’s largest families to celebrate the 100th episode of their series, Bringing Up Bates. The April 5 hour-long special centers on daughter Tori’s beachy bachelorette party and takes a look behind the scenes of the show. In seven seasons of their Up TV show, Gil and Kelly Jo have seen their super-sized family grow even more through the marriages of daughters Tori and Michaela and the births of eight grandchildren. A look at all of the pregnant stars of the small screen in 2018. Fans first met the Bates family, led by parents Gil and Kelly Jo, in 2008 when they visited their long-time friends The Duggars on the TLC series 17 Kids and Counting. 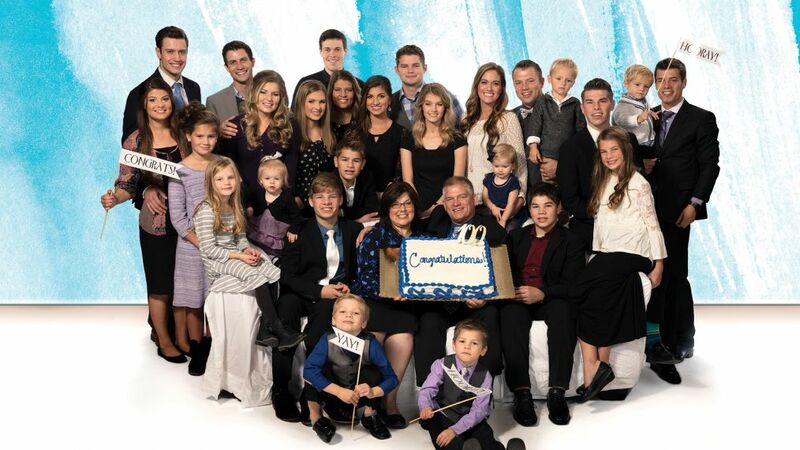 At the time, the Bates clan had 16 children (and one on the way) and the Duggars had 17 kids (with one on the way). Both families share similar conservative Christian values, and viewers were quickly drawn to the cool, music-loving Bates clan. The family made several appearances on the Duggars' series before getting their own TLC special in 2012: The Bates Family: Baby Makes 19, followed by an eight-episode series, United Bates of America. Up TV offered the family a new series, Bringing Up Bates, which premiered on the network January 1, 2015, and the rest is history. Take a look back at the family then and now in the gallery above!